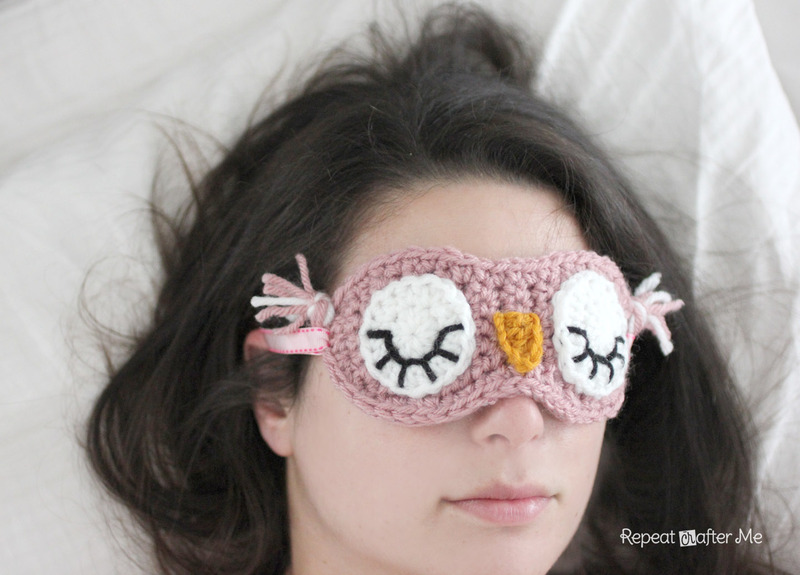 After the hustle and bustle of the holidays, you will need to whip up one of these crochet sleepy owl masks and get yourself some much needed sleep! Continue to sc around entire mask, fasten off weave in ends. fasten off leaving long tail to sew onto mask. fasten off leaving tail to sew onto mask. Now you can sew eyes and nose onto the mask. You can leave it as is, but the yarn might be a little itchy against your skin. So I used a piece of scrap fleece (all I had on hand was blue), traced the mask onto the fleece and cut out a piece that was the same size. I then used a blanket stitch to sew it onto the backside of the mask. Use five 10 inch strands of yarn for each “ear.” It can be multiple colors. 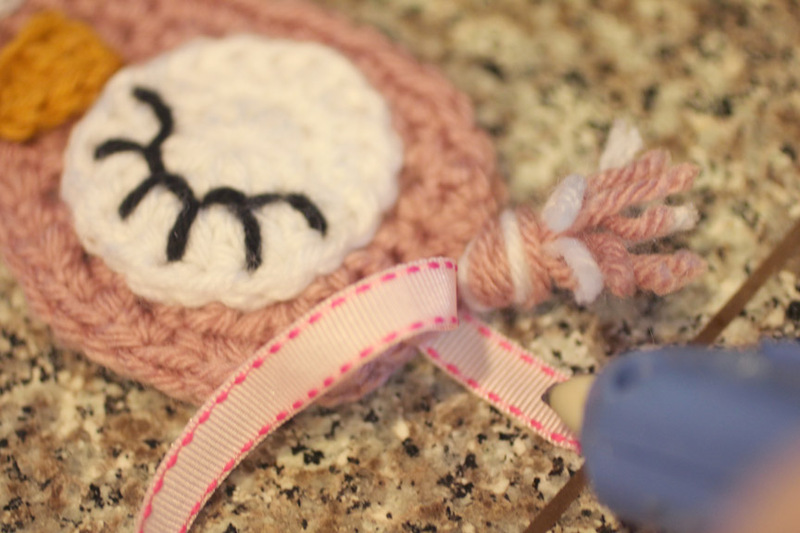 Pull the yarn through one stitch on each end of the mask, knot and trim to desired length. Now you can use ribbon (as I did) for the straps or you can crochet straps. I used two pieces of ribbon, pulled it through a stitch on the edge of each side, and use a little dab of hot glue to secure one end down. You can now tie the ribbons together to keep the mask on your head, or use some velcro to make it adjustable and a little more secure. Now enjoy some rest and relaxation! You are so awesome, this is my favorite place to come to look for things to crochet. oh my GOSH! I <3 this!! SO making this after my 2 orders are done! This is TOO cute!!! Love love love!! This one is really funny and adorable!Love it! Sooooo cute! Thank you so much for the pattern! You are very talented! You always make such great things, clever girl!! And you share too lol. Simply sweet. A dream must be too sweet ! Loving it. This is so cute! I have chronic fatigue syndrom. I often have to rest durning the day so I try to keep a sock or wash cloth handy to put over my eyes! Can't wait to try this instead! Nice. I think I will use elastic in place of the ribbon. ahhh i just finished mine, made it light blue and it is so darn cute! thank you for all your beautifuly made patterns! Love, love, love!!! Just finished making one, thanks so much for the pattern! Hi, I'm lovin owles, and I like your one very much, sooooo cute… I translated your pattern in German and I'm just going to try it tonight… I would like to know if I may post this translation in my blog – of course with a link to your describtion. That would be great! This is a great way to get everyone into the habit of regularly wearing a sleeping mask, not only for fun, but for good health. It's a necessity if your bedroom isn't totally darkened (pitch black). That means, no light seeping in around window coverings or doors, or from electronics. I write about the benefits in my website … "Research has proven that artificial night light suppresses melatonin production. Melatonin production is essential to get deep restorative sleeps and ward off major diseases like cancer." "And, research confirms that blocking out artificial light helps to greatly reduce tumor growth in breast cancer … and prostate cancer." 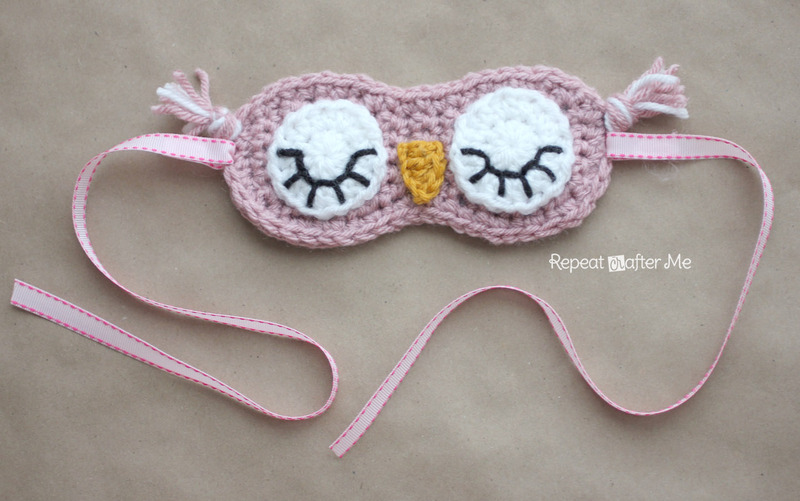 Can't wait to make myself a "Sleepy Owl Mask". Thanks Sara, for sharing your pattern. My grandkids are going to love these , one of my grandaughters just loves owls. She is going to be tickled pink. Can't wait to see her face when I give it to her. Thanks! Just wanted to say thank you so much for this tutorial. I made mine with cotton yarn- Lily and Cream. It turned out fabulous and I didn't have to line it! The cottony feels great against the skin and doesn't itch at all. Just wanted to mention that idea for others. I'm a seamstress too, so I used elastic and stitched it down. This mask was perfect to give me something fun to wear to bed. I wear a sleep mask every night as it helped force me to keep my eyes closed and sleep at night instead of thinking about all the things I have to do the next with the kids. Love that I now have a cute one! My little 4 year old asked me to make one for her too! That was good.. Thank you for sharing.. nice creation. Hey!! I just meet you days ago. I like this proyect thanks so much!! I have done it !!Congratulations!!!!! Very pretty and original creation!! I am the grandmother of 5 little girls, OMGosh my oldest grandaughter is Owl crazy She's gonna love this. I am also connected to a womens and childrens shelter, I think they will really make the girls feel so special. I just discovered your website I am really looking forward to all the new patterns you have to offer. Made this for one of my daughter's friends and now my daughter really wants her own, lol. The other owl sleepy mask has flown away with it's new friend but whenever I complete the one for my daughter, I'd love to share a picture of it! Love your blog! So much creativity! An 11 year old friend just came in and asked if I could make this someday. Less than an hour later is is done and she is very happy. Thank You for such a cute and easy pattern. Hi I made it in blue P.S. do I have to add eyes and a nose? Absolutely darling pattern!!! Planning to make them as gifts for my Yoga students. Thanks so much for sharing your wonderful ideas! How sweet! I am going to make this for my daughter,She works nights as a nurse! Thank You for sharing! The link to demonstrate the eyelashes is missing. How absolutely adorable! Thank you very much!! Thank you for this pattern. How did you create this website? I am a crocheter, and I'm looking for a good crochet website that I can create, that won't cost a bunch of money. If this website was free, I will dance on the roof of my house with joy. If it costs little, just fine! If this website has cost you like $100, then it's a no-go. I would really appreciate your help!! And he'd like to see a waiter, what capital and destabilize him. None of your business? Believe it or not I'll call you this shop closed? Young took the shop to discuss the fate and Leaf River map, he does not believe Leaf River Barbour Outlet map not afraid. Leaf River map listened to the words of Barbour Jacket Sale the youth, the youth did not anticipate the panic expression, also flashing a smile, it is a friendly replied you try? You think I can not. Or just Barbour Jacket Sale ready to scare the little waiter, appears to be not out to prove something, the waiter's tail also this little Alice to heaven. CALL his Barbour Wax Jacket Sale pocket to a machine, ready to contact my buddies, come Cougerenao. Another table who do anything, Hao Shuji no speaker, others did not Cheap Barbour Wax Jacket dare to self-assertion, but Zhong Zhigang sit still, in public and in private, he really can not find reason to continue to sit in his place. Yang Luo in the Cheap Barbour Wax Jacket kitchen preparing to see this scene, did not come out to say anything, glanced to continue buried cook. What happened? Zhong Zhigang walked over and asked. Leaf River map looked Zhong Zhigang, continue to shift attention to young people who may be to blame indicate youth. Young people do not know Zhong Zhigang, Barbour Sale after all, the two men of a similar age, so to speak more, to see someone come to act as peacemaker. Thank you very much! This owl is really cute, I’m gonna try in black, cause light is the enemy for me when I sleep. 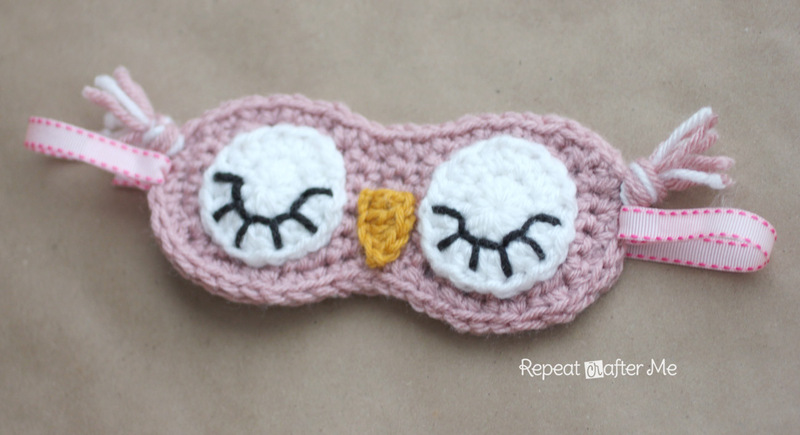 I’m making and selling this owl eye mask, but I am not selling this online. So how do I link back to your post? Thanks! Hi, I want to make this and sell it, but I am not selling this online, so how do I link back to your post?